Female Vets Navigate Post-War Stress, Duties America's female veteran population has grown to an estimated 1.9 million, and the Department of Veterans Affairs projects 50,000 more servicewomen will join that population in the next five years. When they return, many will pick up where they left off, as mothers, wives and caretakers. 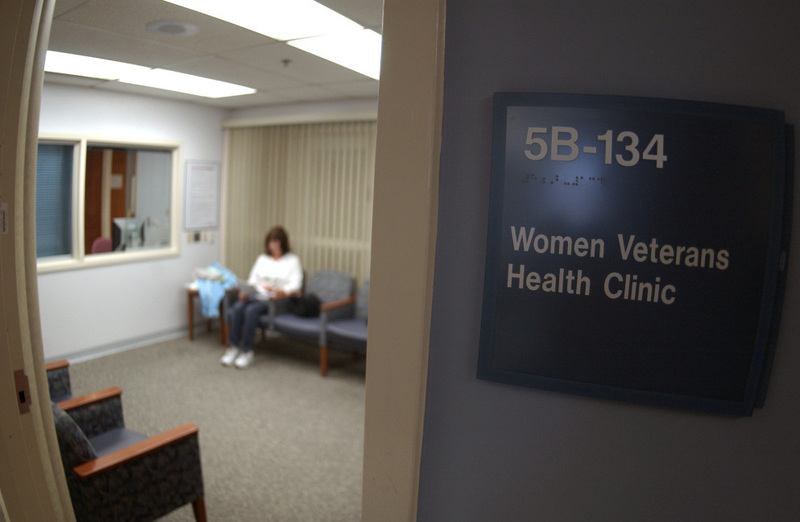 The Department of Veterans Affairs has sought to improve the care its hospitals offer to female veterans. In this file photo, a woman sits in a waiting room at the Veterans Affairs Medical Center in Martinsburg, W. Va. The first in a series about the challenges female veterans face as they transition to civilian life. America's female veteran population has grown to an estimated 1.9 million, and the Department of Veterans Affairs projects 50,000 more servicewomen will join that population in the next five years. When they return, many will pick up where they left off, as mothers, wives and caretakers. In Philadelphia, some female veterans are dealing with family responsibilities while still struggling to cope with the lingering effects of war. Louise Hawthorne, a veteran of the first Gulf War over a decade ago, gets treatment at the Philadelphia Veteran's Affairs Hospital. She was a chemical operations specialist, dealing regularly with radioactive material and biological weapons. She suffers from post-traumatic stress disorder, along with a number of health complications she feels are related to her exposure. "I've had several miscarriages. I've had a couple of strokes," she says. "I was also gang-raped in the military four separate times, none of which have been prosecuted." Hawthorne alleges that she tried to report the rapes to superiors but was rebuffed. She is part of a growing class-action lawsuit filed in federal district court in Virginia on behalf of active-duty and veteran victims of sexual trauma. Back then, Hawthorne says, she felt helpless. She tried to just get over it and do her job. "We have basically trained ourselves to act like, 'That didn't hurt,' roll with the punches," she says. "And so when we come back and we have PTSD, flashbacks, things like that, we deny it more than men do. Because we're saying, 'Aw, well, she's just emotional.' "
After she returned home, Hawthorne tried to keep her symptoms at bay. She finally had a baby with her husband, but then their marriage fell apart. And Hawthorne got sicker. "When I did start coming back and forth to the VA hospital, I would often blow off appointments because I had to take care of my daughter," she says. The Philadelphia Veterans Affairs Hospital doesn't have child care. And for Hawthorne, missing appointments, coupled with self-medication, was a recipe for disaster. "I remember one instance when I had laid down," Hawthorne says, "and she couldn't have been older than 5. And I'd taken my medicine, and I was out cold. And I woke up to these little baby hands trying to do CPR." It's the kind of thing Marsha Four has seen before. She's the executive director of the Philadelphia Veterans Multi-Service and Education Center. "When you're suffering from this kind of pain, it bleeds over," Four says. "It becomes part of everything that you do." Four speaks from experience: She's a Vietnam veteran. And she says the transition from serving in the military to being a caretaker isn't always easy. "You know, if there's issues or problems, we'll deal with them later," she says. "We have to get to the ballgame. Or we have to get to the grocery store. Or so many other things take precedence over our own health." Four says the VA is working hard to provide better services for women. And things have improved. There's better obstetrics and gynecological care, and some VA hospitals are opening child-care centers. But, Four says, there's nothing like just talking with other female vets. "They are your sister-in-arms," she says. "They understand you, they understand where you came from." That rings true for Alfeia DeVaughn Goodwin, a veteran of Operation Iraqi Freedom. "I was very fortunate because I had that," she says. "I had someone I could just call and say, 'What do I do?' "
When Goodwin returned to the United States, she had three kids, a house that burned down, and a new career as a police officer. She recently founded Green to Blue, a group for veterans who are becoming police officers. Each morning, she sends out dozens of encouraging text messages to others in the group. "If you need a ride to drill, or if you need someone to call you in the morning, then that's what we need to do," Goodwin says. "We need to link people up together who can help one another." Another way vets can help one another, Goodwin says, is with baby-sitting duties — a favor that could make all the difference for a female veteran in need.